The archetype of a pencil is fairly standard in the American mind—yellow, with a dark pink eraser nub, number 2 (and often required for standardized tests). Walk into CW Pencil Enterprise, a small shop in Manhattan, and you’ll find over 200 varieties of pencils from around the world. You realize quickly that you underestimated this simple yet revolutionary tool. Caroline Weaver, like most of us, started using pencils as a kid, but she found herself entirely enamored with them after her mom brought back a set of Caran d’Ache colored pencils from Europe. Since then, she has spent her life admiring, studying, and using pencils passionately, and for the last two years, her business has been dedicated to them (and the accoutrements they require and desire). 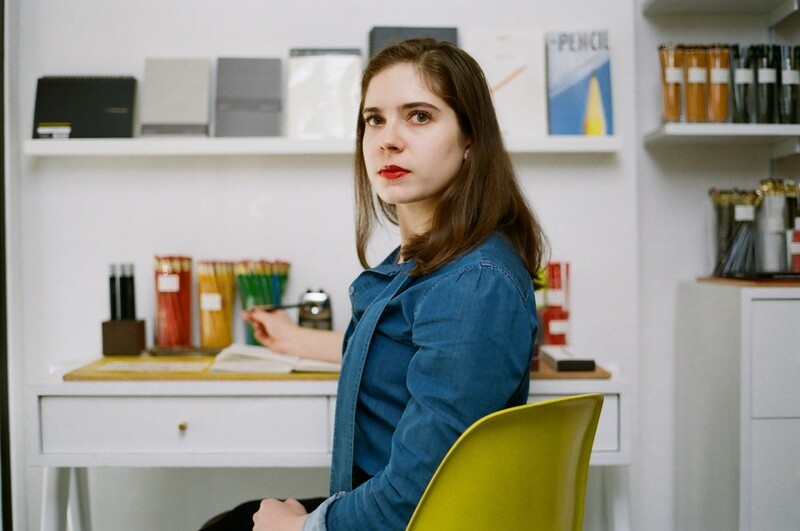 In 2014, Caroline launched CW Pencil Enterprise as an online shop, and shortly after, she actualized her childhood dream of running a quaint pencil shop by opening a brick and mortar location. Nothing like CW Pencil Enterprise existed, even in a place as saturated with specialty shops as New York City. This made setting up shop even more challenging as there was no blueprint to follow, especially in terms of formulating a business plan. And the question remained, how would people respond to a store strictly for pencils? Yet, the accolades came in quickly from the likes of The New York Times and Bloomberg. With resounding success and committed clientele, Caroline has grown CW Pencil Enterprise based on the philosophy of knowing its products like no one else. Below, she recounts the challenges she faced when opening, the most unusual pencil in stock, and the fascinating histories you pick up whenever you hold a pencil. BOND STREET: What’s your earliest or fondest memory of using a pencil? CAROLINE WEAVER: When I was about 6 years old my mother went to Italy and brought back a set of Caran d’Ache colored pencils for me that came in a really beautiful tin with wildflowers on the cover. That was my first memory of loving an object in general. Even as a 6 year old I didn’t really use them because I thought that they were too nice. They disappeared for years, and it turns out my mom borrowed them and lost them. We did eventually find them again however, and I have them still. They’re quite short now. Most of my early pencil memories go back to my childhood and my mom—she’s a real pencil snob. We didn’t have access to good pencils in the small Ohio town I grew up in. BOND STREET: What’s the origin story of CW Pencil Enterprise? What led to its founding? CAROLINE WEAVER: I originally thought about it before I went to college. I went to art school with no intention of being an artist. I knew I’d do something creative, but in the back of my head I always thought that I wanted to be an old lady talking about pencils all day in a tiny shop. That’s where the idea started. I didn’t properly consider it till I was out of college and in New York City and had a job I didn’t like. One day I woke up and thought, I’m not happy, I love New York but I have to make a change. At the time I was 23—and that’s just the time you should take risks. BOND STREET: What was the biggest challenge you faced when you were first starting up? CAROLINE WEAVER: There were a lot of challenges. I knew a lot about pencils, but not much about business. I knew how I wanted to design the store, but that didn’t help when I had to figure out how to buy inventory or build out a shop. I think the biggest challenge was being comfortable with what I was doing. I was comfortable in a way, but I was really scared to put this thing out into the world. I was scared to tell people about it. I really thought that anyone I told would think I was crazy, because the type of shop I have is not something that existed. I couldn’t do a lot of market research either because there was no other multi-brand specialty pencil shops. BOND STREET: How did you raise the capital to open the store? CAROLINE WEAVER: I used my own savings in the beginning. I did everything very slowly. I had enough money to pay for my first few months of rent and to buy the inventory I needed. Pencils are generally a very inexpensive thing to buy wholesale. I wasn’t planning on opening a physical store so quickly after opening my online shop, but I happened upon a space that had shockingly affordable rent for Manhattan. It just kind of felt right. 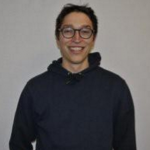 I’ve never had any sort of outside funding. BOND STREET: You stock around 200 varieties of pencils. Why such a range? CAROLINE WEAVER: They’re all a little bit different in their design and function. Every company makes their graphite core a little differently, and the graphite comes from different parts of the world, or they have different additives to the graphite that makes their pencils special. The thing about pencil companies that’s really interesting is that most of them have existed for 80-100 years. A lot of these pencils have really amazing histories. Many of these companies are still family-owned. So a lot of it is not just the function of the pencil, but the story of the pencil. BOND STREET: Tell me one of the best pencil stories that sticks out in your mind. CAROLINE WEAVER: One company called Shahsons out of Pakistan started in the 1950s. They’re known for a pencil called the Goldfish Autocrat. It’s very recognizable—anyone from Pakistan will recognize it. It’s a great pencil at such a great price point. They were originally scented to smell like sandalwood. The current family owner of that business wrote us a letter once and said that he was pretty sure that his grandfather meant to call it the Goldfish Aristocrat, and that something just fell off in translation. That’s one of the stranger pencil names that I know of. 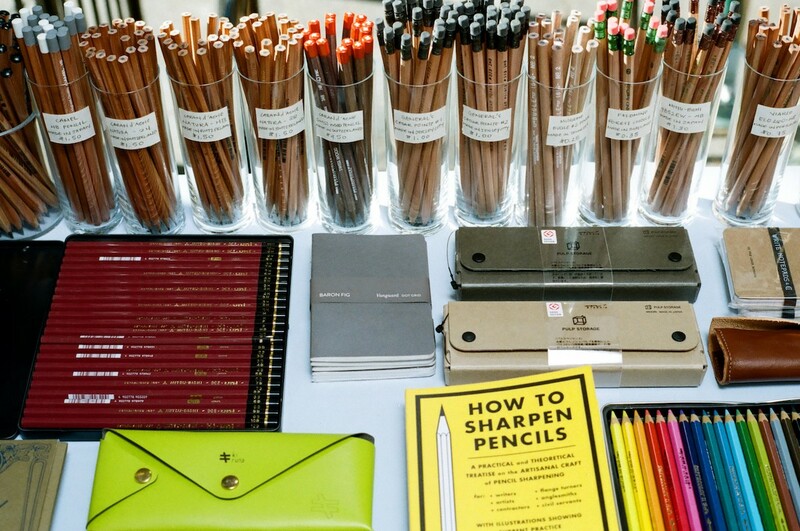 BOND STREET: What’s your most popular pencil? 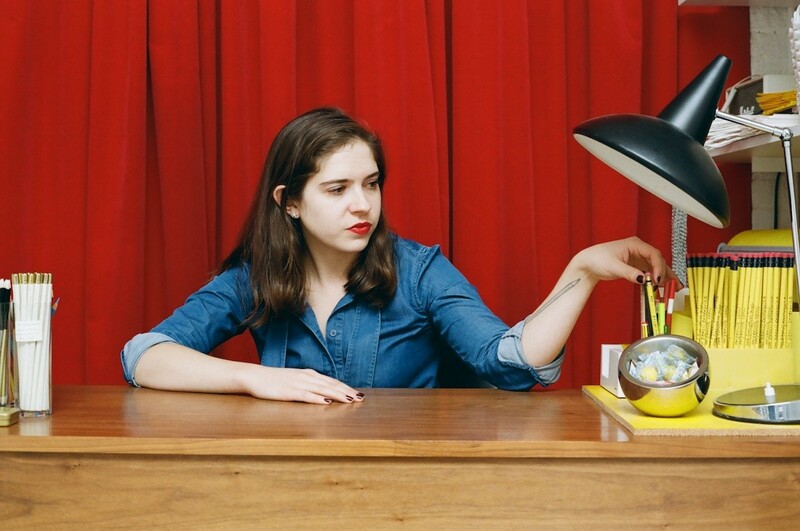 CAROLINE WEAVER: We have a couple of most popular pencils. We have one that’s called the Palomino Blackwing Number 2. That’s the pencil that we think of as the gateway pencil. It’s one of the more readily available, high-end pencils that exist right now. It has a flat fill, which is the metal part at the end of the pencil that holds the eraser in, and the core is really smooth. It was a favorite of John Steinbeck, Walt Disney, and Stephen Sondheim. There’s another one that’s pretty expensive, it retails for $4.50—that’s made by a company in Switzerland that’s 100 years old called Caran d’Ache, and the pencil is called the Swiss Wood. It’s made out of beachwood from the Jura Forest in Switzerland, this really beautiful dark wood that almost looks like walnut. A lot people say it smells like brown sugar. We also sell a lot of American pencils that are a bit harder to find. There are only three pencil companies left in the U.S. who still manufacture here. Surprisingly enough, a lot of their pencils are really hard to find. BOND STREET: And your most unusual pencil? CAROLINE WEAVER: We have one that we just got a couple months ago that’s made by a company called Viking which is based in Denmark. They make this pencil that was commissioned by the Danish government for voting. It’s really unique: it’s very large, the core is extremely thick, but it writes perfectly smoothly. There’s a hole drilled into the end of the pencil so you can tether it to something. We also have pencils from India that are all hand-marbled, those are really incredible. We also carry a couple of the only copying pencils to still be manufactured—they were popular during World War II because they had aniline dye in it, which makes it permanent. It was also transferable, so you could put a wet piece of tissue over it and make a copy of the document. BOND STREET: Why do your customers come to the store? CAROLINE WEAVER: We have a lot of left handed customers come in who don’t like pencils because they get smudgy as they write. A lot of the people that come into our store though are either really curious or they’re already into pencils and they’re looking for things that they don’t already know about, or they come in with a specific thing that they need help with. Or they need a pencil for a specific purpose. We get a lot of people coming in looking for a good pencil to do the Sunday New York Times crossword puzzle. Artists and journalists come in a lot too, but really it’s mostly just people who just use pencils in their everyday lives. BOND STREET: What sort of marketing program does CW Pencil Enterprise have? CAROLINE WEAVER: We’ve been really fortunate that it’s just happened naturally. We had some really big press in the beginning: we had an article in The New York Times two months after we opened, and it’s been kind of a snowball effect ever since then. We’ve had a lot of international media coverage and write-ups in magazines. I have a colleague named Caitlin who is much better at the marketing thing than I am, and I’m grateful to have her. I guess our next step is to seek that stuff on our own. 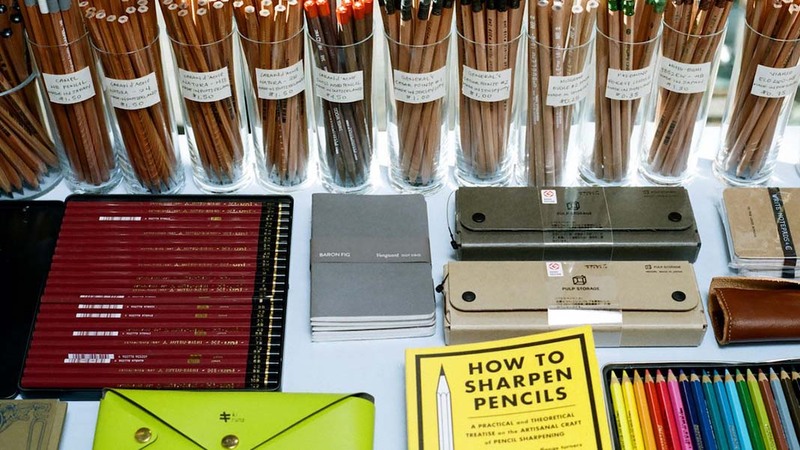 BOND STREET: What’s the 5-year vision for CW Pencil Enterprise? CAROLINE WEAVER: That’s a difficult question quite honestly, especially since I set my expectations too low in the beginning. Everything that’s happened in the past year and a half is the stuff I thought would take five to ten years. I have no interest really in opening other physical stores. I think it’s nice that we have just one store and that everyone who works there is really involved with the products we sell. A lot of our customers are from out of town, and they come to our shop as a sort of mini-pilgrimage. I think that we would lose a little bit of that if we had other stores. We’re just looking to improve our online growth and start developing some of our own products, which we’ve begun doing slowly. We’re doing more pop-ups and collaborative things now too. BOND STREET: What’s the biggest business challenge that CW Pencil Enterprise currently faces? CAROLINE WEAVER: The biggest challenge is trying to navigate how to sustain what we’ve got going now, and trying to figure out what the next move will be. I’m a little unsure. Though I say I don’t want to open another shop, maybe that’s not the case, and I just haven’t given it enough thought. I started this business to sell the thing that I’m selling, so I’m just trying to find a space where everything that needs to happen is happening, but where I can also find the time to be in my shop on a weekly basis interacting with my customers. I’m quite happy with the way things are now, to be honest. 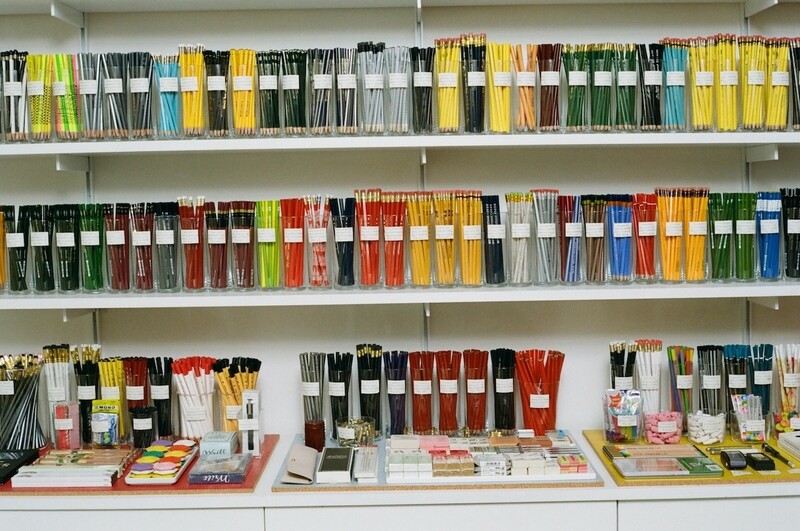 BOND STREET: What’s your personal favorite pencil you currently stock? CAROLINE WEAVER: I always say that’s like choosing a favorite child. There are two pencils that I currently have in my pencil case. One is a pencil made for a company called Craft Design Technology—they do a lot of design-y office supplies and are based in Japan. They have a pencil that’s made by a company called Camel that does not have a fill on it, but it does have an eraser—it’s just this white eraser at the end attached on its own. It’s this beautifully lacquered pencil that’s really minimalist and aesthetically pleasing, but it also has great point retention and is really smooth. I also have a pencil that we developed with Caran d’Ache in Switzerland that’s all black. It’s slightly larger than the normal pencil diameter, so I find it more comfortable to hold for extended periods. BOND STREET: What are your 5 favorite small businesses?